Rejecting derogatory labels and refusing to let other people's prejudice hobble your success is the theme of BMW Mini's Olympics push from Butler, Shine, Stern & Partners. "The campaign targets the Mini mind-set," says Tom Noble, head of marketing at the brand. "It's about people who think independently. Our fans are people who appreciate design and also appreciate individuality. What we do know is that the Olympics indexes highly with our fans. They appreciate sports, and there are a lot of sports during these Games which are unique and different, only coming around every four years, and so this is a good platform to reach our audience." In a series of expanded online interviews, the longest topping out around two minutes, the competitors tell their personal stories. You can watch the remaining spots with weightlifter Morghan King, boxers Carlos Balderas and Claressa Shields and swimmer Cullen Jones below. "We have a message that is topical if you look at what's going on in today's world, and you get a real, authentic view of what people's struggles are and what they have overcome," says Nobel. "We believe having a relevant, inspiring message with a topical theme should cut through" the clutter of other brands' Rio-themed ads. Indeed, the campaign makes its case in appealing style, and gains traction by casting accomplished, relatable pitchmen and women who speak from the heart. And because we've all be unfairly labeled at one time or other, or told we'd never reach our goals, the campaign transcends sports to make a broader statement. Frankly, we could have done without the product tie-ins closing each online interview, as the athletes tend to drop the ball by applying the "Defy Labels" concept to the Mini itself. "This is a message we as a brand hold close to our heart," counters Nobel. "In many ways Mini is labeled, but that doesn't hold us back." Fair enough, but simply flashing a logo and tagline at the end would have sufficed—the audience is clever enough to infer the brand connection (if, indeed, they even feel a need to do so). 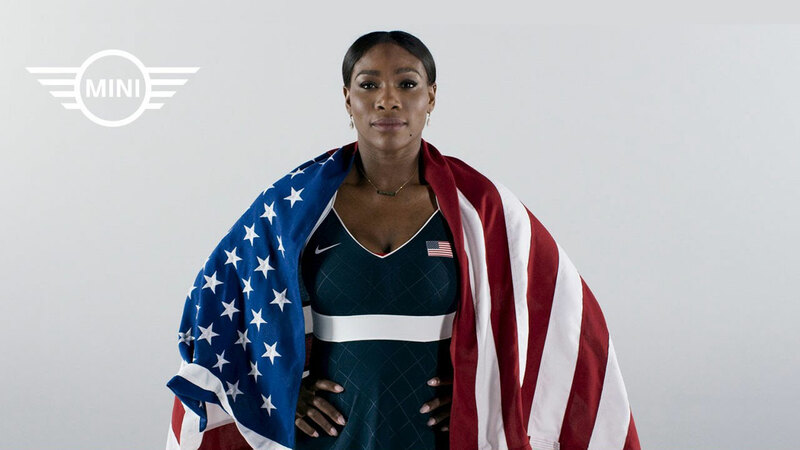 Finally, you might notice that the Olympians literally wrap themselves in Old Glory in each online spot. This potent visual cue serves as a reminder that embracing our unique selves and finding strength in our differences helps propels the American dynamic. Ultimately, refusing to be labeled makes our nation so much more than the sum of its many parts, pointing the way toward a star-spangled future.